Wash vegetables, peel if desired, and cut into similar sized pieces. Smaller pieces (about 1/2 inch thickness) brown more and cook more quickly. Long thin pieces (asparagus or beans) can be left whole. Prepare a baking sheet that will hold the vegetables in a single layer. A metal baking sheet without sides allows more browning. A covering of foil will make cleanup easy. Toss the vegetable pieces with just enough oil to make them shine. 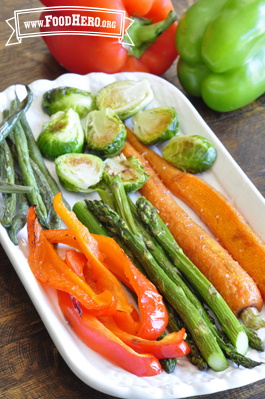 Spread the vegetables on the baking sheet in a single layer. Roast until tender and slightly browned on the edges. Baking time will depend on the thickness of the pieces. Thin pieces (asparagus or beans) may take 5 minutes; pieces about 1/2 inch thick take about 15 minutes. Stir or turn about halfway through the roasting to obtain more even browning. Remove to a serving dish and sprinkle lightly with salt or seasoning of your choice. Try vegetables like: beets, Brussels sprouts, carrots, onions, sweet potatoes, peppers, asparagus, broccoli, cauliflower, green beans, squash and more. Try additional seasonings like: thyme, rosemary, oregano, balsamic vinegar, and lemon juice.